An investment in farmland has very low risk and yields higher returns than those of other investment classes. 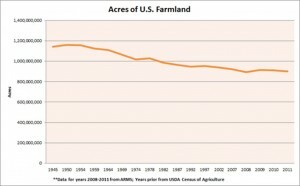 There are many reasons to invest in farmland. 1. Farmland Appreciation. According to a Yale University Study, Farmland Values over the last 22 years are increasing by leaps and bounds. The other investment classes available to you can’t keep up. 2. Cash Rents. As a farmland investor, you will receive gains from farmland appreciation, but also from cash rents. The farmer that rents your farmland will pay cash rent checks to you annually. 3. To Diversify Your Investment Portfolio. As an Investor, it’s important not to put all of your eggs in one basket. Farmland is a great diversification strategy. 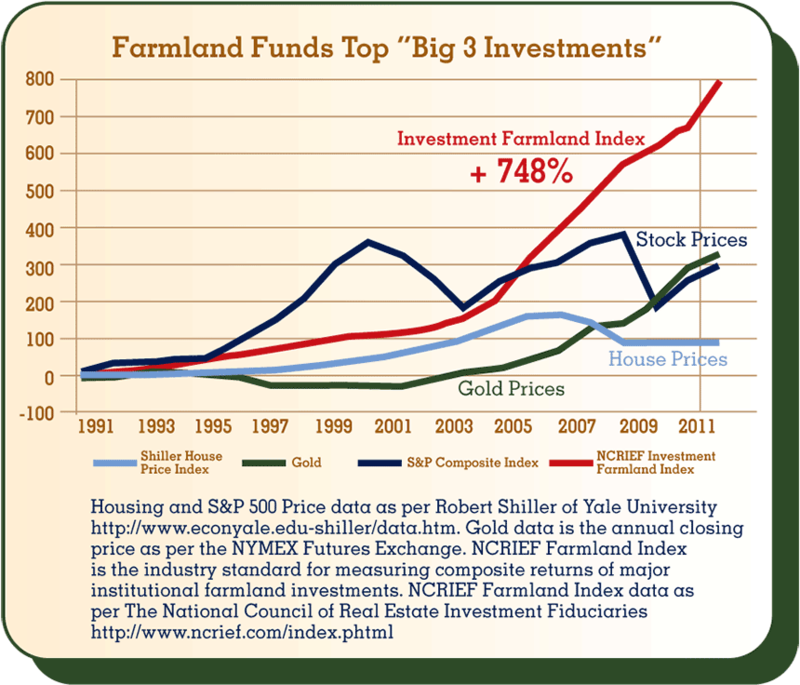 Farmland has no correlation to the stock market, bond market and other types of real estate either. 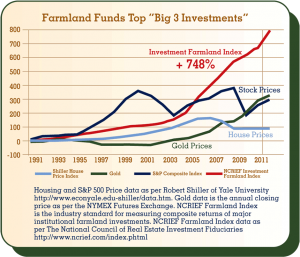 For example, during the recession, farmland continued to rise in value while the stock market, bond market and real estate were severely affected. It allows you as an investor to invest in something solid and tangible with higher returns and less risk. 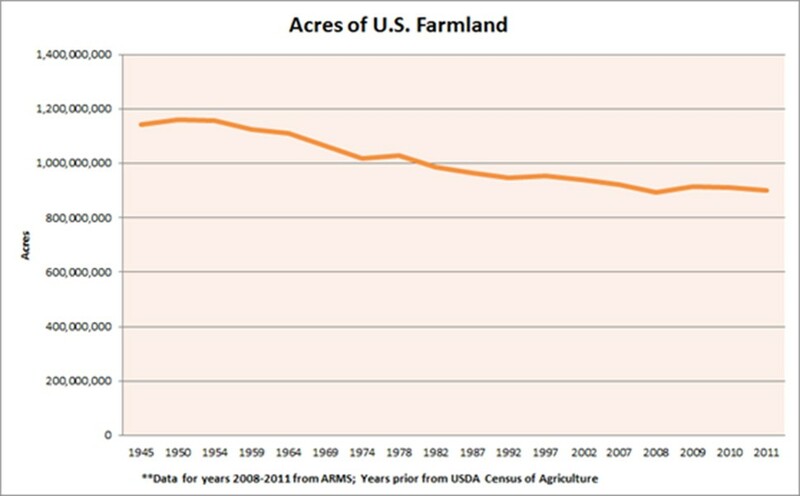 Loss of approximately 300,000,000 (300 million) American Farmland Acres in 66 years. 5. World Population is increasing which is Increasing Demand. 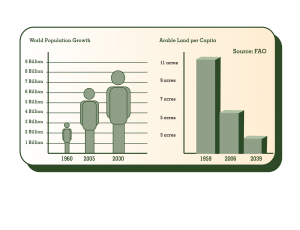 The chart below created by the Food and Agriculture Organization demonstrates clearly that World population is increasing and because of this, arable (farmland) land per acre, per person is decreasing. In 1959, there were 11 farmland acres per person in the World. In 2030, it is predicted that there will be let than 3 acres of farmland per person in the World. 6. Middle Classes in China and India (36% of the World population) are rapidly increasing which is Increasing Demand. According to Pacific Money Economics and Business, China’s Middle Class will increase from only 4% of total population in 2000 to 75% by 2022. When lower classes move up into middle classes, their diets change drastically and they eat more, especially more meat, according to the Organization for Economic Co-Operation and Development. 7. TIAA, Teacher’s Retirement Fund is investing in farmland. See their chart below. The left side of the chart shows returns increasing as you go from the bottom to the top. The bottom portion of the chart shows risk increasing from left to right. 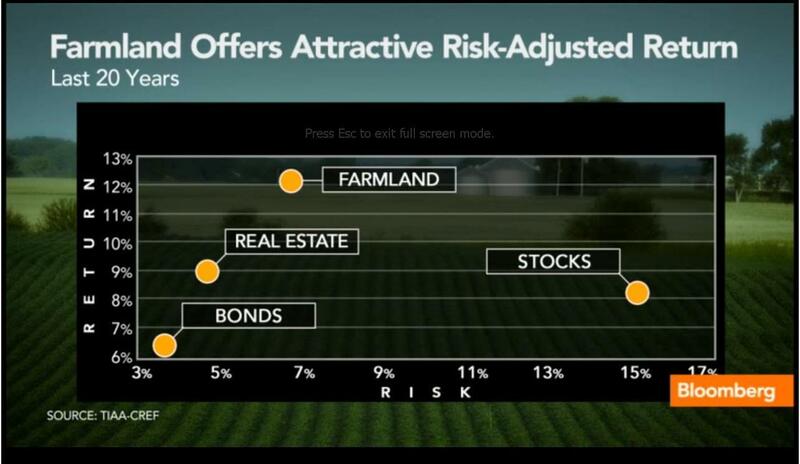 Farmland has the risk close to a bond but returns that are higher than the stock market when it is doing well.